I had barely passed 24 hours in San Miguel before I began to feel a sort of discomfort. A sense of being ‘ill at ease’……..’out of place’. It was certainly not because I am unused to travel, lord knows I’ve spent many years responding to my wanderlust. What was it about this place that was different (and not in a good way)and that made me wrinkle up my nose and scratch my head every time I approached the Jardin? Unable to get comfortable, I took to wandering in any direction that would lead me away from this dreaded locale. Eventually, after several weeks, I realized what was happening. I was tired of all the expats staring at me! Probably wondering what I was doing in their shangri-la. When my anticipated volunteer project did not pan out, I was truly out of sorts. Granted, I did meet a few folks with whom I enjoyed spending time. Thank god! I left SM loving the town and still puzzled as to why the expat gangs have so taken hold in this town. Is is just because it’s cheap and the weather is good? OKAY. I guess I can accept that. But in much the same way that I do not understand ‘joiners’ in general, I do not get the need for the gangs. Then again, I don’t get the whole expat thing anyway, or at least not on any level that makes sense to me. This lovely town is great to visit, at least once. Maybe even more often if one finds ways to connect to the indigenous population and is able to escape ‘gang’ membership. 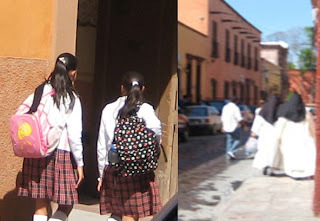 As you start to look for the Gangs of San Miguel your eye will go towards groups who are dressed alike. But be careful not all those who dress alike are in a gang. Here are two examples of people who dress a like but are not in gangs.